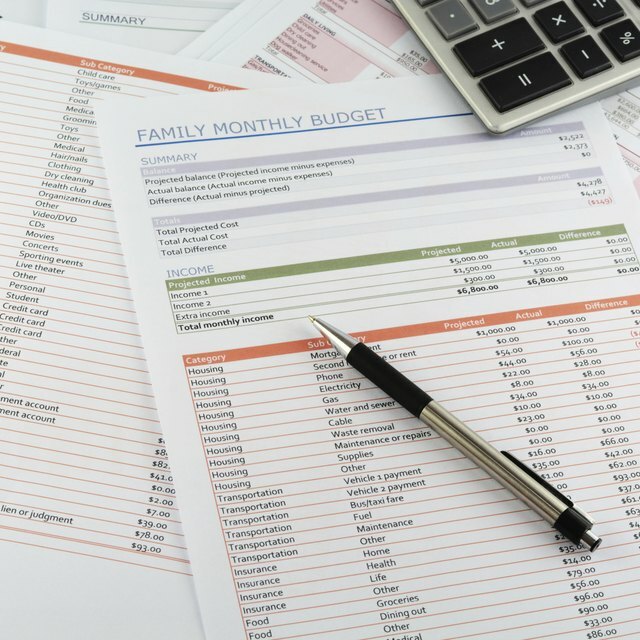 Budgets are often described as a necessary evil. Few people enjoy tracking every purchase they make or refraining from buying a product because it will put them over budget. However, if you want to take more control over your spending habits, save money or make investments, budgets are the most practical way to achieve these goals. Identify what you are currently spending your money on. You may look back at past receipts and fixed purchases or track your spending for one month. To track your spending for one month, every time you write a check, use a credit or debit card, make an automatic bank deduction or pay in cash, save the receipts. Later, sit down with your receipts and write down in a notebook or on an Excel file spending categories. Possible categories include groceries, eating out, entertainment, rent, electric, utilities, gas and travel. List these horizontally across the sheet in columns. Fill in the rows with individual amounts spent in each category. When finished, add up each column and write the totals in the last row. Evaluate your spending categories. Look at your column totals and identify where you are spending the most money. Some of these categories will likely be necessary expenditures such as rent and gas. However, if you are surprised by how much you are spending on eating out at restaurants or entertainment, these are areas you may want to set goals for. Based on the numbers in each column and your monthly income, set goals for each category that take into account your long term financial goals and allow you to save money for an emergency. According to CNN Money, set a goal to save at least 10 percent of your income. Many financial advisers recommend savings to cover three to six months of living expenses. Track your future spending to ensure you reach your budget goals. Several online resources help individuals track and budget spending. Mint.com is a free service that automatically tracks your credit and debit card spending once you input your accounts into their secure system. The program detects your transactions and attributes each transaction to a budget category. For example, if you purchase gas with a credit card, the program will automatically budget that amount to your "gas" category. If you prefer to keep your own records, Excel spreadsheets allow you to easily sum columns. A simple notebook with columns is also effective. Reevaluate budget if you are not reaching goals. If your rent or electric rates raised, change this in your budget. If your budget is unrealistic to your spending, readjust it the best you can. If you have a realistic budget but you continue to go over in areas such as food and entertainment, brainstorm and create a list of ways you can save money in these categories. Follow through with your ideas.